EINDHOVEN, THE NETHERLANDS – Together with its partners, TULiPPS Solar B.V. has developed its first fully functional prototypes of what is currently projected to be the world’s lightest building-integrated photovoltaic (BIPV) solar modules for pitched roofs and cladding applications. These modules have an area weight of 8.5 kg/m2 (1.7 lb/ft2), so a unit that is 180 by 85 cm (71 by 34 in.) 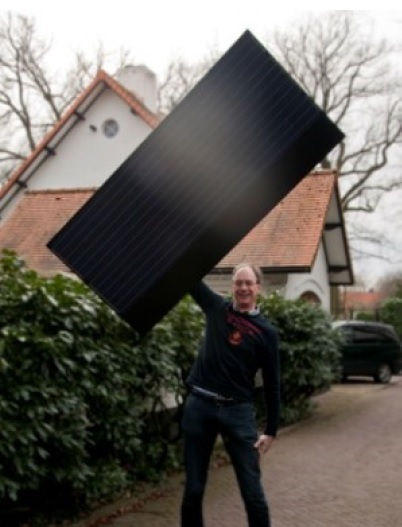 weighs just 13 kg (29 lb) compared with conventional BIPV modules with a typical area weight that can range from 13 to 20 kg/m2 (2.7 to 41 lb/ft2). The new prototypes were developed under the Lightweight Rooftop BIPV System (LiRoB) innovation project, which itself is part of the Topconsortium for Knowledge & Innovation (TKI): Solar Energy program under the National Topsector & Innovation policy, Renewable Energy section sponsored by the Dutch government. Last year, TULiPPS Solar won the Dutch Solar Award in the Industry Development category for its innovative COSMOS® module technology platform, which was developed cooperatively with partners from the plastics/composites, automotive, PV module, roofing, and PV installer market segments. Two unique aspects of the platform are the use of a very-thin 2-mm (0.08-in.) face layer of fully tempered glass plus a hybrid composite/metal “underbody” construction that supports the rest of the module. Since bulky and unattractive conventional aluminum PV frames have been replaced by the patent-pending “frameless” support system on all COSMOS modules, the effect is a more attractive GlassEnergyÔpitched roof or cladding that weighs and costs less yet is tougher (more break resistant) than conventional BIPV modules. Design flexibility also provides the opportunity to cover far more surface area than is possible with conventional BIPV modules. they require less effort by solar installers to transport them to and secure them onto pitched roofs or cladding (helping make installation easier and faster with fewer workers, also helping to lower costs). The higher transparency of the thin glass used on the new modules means they offer greater conversion efficiency than conventional modules with thicker glass. Furthermore, their low weight and plug-and-play installation features shorten installation time, helping reduce both the installed cost of PV modules as well as the total cost of PV systems so PV solar technology becomes more affordable and more accessible in more places. As Paul Stassen, founder and CEO of TULiPPS Solar and inventor of the technology explains, “Thanks to the tremendous design flexibility that we built into the COSMOS technology platform, solar modules no longer need to be so limited by size and shape. It gets very interesting when I try to explain to a framed module maker that we can make almost any shape ¾ yes, it probably will be square or rectangular, but it doesn’t have to be¾ and that we can make it almost any size and almost any color. It’s equally interesting when I try to explain to a building contractor that, yes, you still have your roof piece, but now it does far more than keep your building dry ¾ it also generates energy. And, yes, we can install this on any roof. The technology brings flexibility to the power of three, which is why we predict that GlassEnergy roofs and cladding will be the next new market segment in the building industry.” The LiRoB modules have been designed to be suitable for both renovation projects as well as new construction. To speed development of commercial modules and take advantage of the latest technologies available in the Netherlands ¾ a global leader in PV cell technology and module-manufacturing equipment ¾ TULiPPS and select development partners formed the LiRoB project to develop products for GlassEnergyÔ roofs and walls. The system consists of a combination of active glass-faced solar modules plus “fittings” (spacer/filler panels without PV cells) in multiple sizes. The filler panels ¾ which look just like fully functional modules ¾ are for locations on a roof or walls where little energy generation is possible due to shading, or where it is necessary to go around obstacles like chimneys or windows. The versatility of the system means an entire roof or wall can be completely covered, assuring a clean consistent look that is weathertight, yet in locations that will generate little or no energy, the building owner does not have to pay for PV cells. Each consortium member has worked on adapting its own technology area to enhance performance of the innovative frameless module platform invented by TULiPPS to help ensure the final commercial product will be accepted throughout the PV supply chain, will be appropriately designed and certified to meet the needs of the building industry, and will have the lowest balance of system costs of any BIPV module on the market. Thanks to vital contributions from development partners, mass-production techniques, and a well-considered manufacturing process, the new system should quickly achieve lower costs and market acceptance. Other LiRoB consortium members working on technology to enhance COSMOS BIPV modules include: Scheuten Solar (Venlo, the Netherlands, module production); SCX Solar (Someren, the Netherlands; roofer/module installer); Oskomera Solar Power Solutions (Deurne, the Netherlands, engineering procurement contractor (EPC) and installer); SABIC Petrochemicals B.V. (Sittard, the Netherlands, resin supplier of long-(glass-)fiber thermoplastic (LFT) composite); DSM (Heerlen, the Netherlands, supplier of high-transmission anti-reflective coating for solar glass); RESIN (Products & Technology) B.V. (Enschede, the Netherlands; polymer compounding); Yparex B.V. (Geleen, the Netherlands, adhesive resin supplier), SolNed (Veldhoven, the Netherlands; junction boxes); and KIWA Nederland B.V. (Rijswijk, the Netherlands, independent testing and certification organization). The program is further supported by three Dutch knowledge institutes: Solar Energy Application Centre (SEAC), Energy Research Centre of the Netherlands (ECN), and the Building Department of TNO. By involving key members of the BIPV supply chain in the development process, the LiRoB project helps ensure that the technology platform meets the needs of all supply chain members involved in production and installation of BIPV modules. It also helps ensures that the platform is flexible enough to offer many other innovative solutions that will transform solar modules into function-integrated building and construction products in the most cost-effective and lightweight manner possible. Initial prototypes were completed in March and are currently out for testing and evaluation while design and product specifications are finalized. Later this year the first modules will be installed at pilot projects to enable field testing. Module certification is expected to be complete by year’s end, with large-scale commercial production beginning in 2014. COSMOS module technology will be made available to existing and new PV module manufacturers under a franchise-licensing agreement with TULiPPS Solar. The technology can be incorporated onto conventional module production lines with only a single change: a different processing step at the end of the production line after lamination. In this case, a new piece of equipment (currently under development by TULiPPS and its partners) will need to be purchased to replace the conventional framing machine. Changeover from conventional module production to the COSMOS construction method is not complex and will require limited additional investment. In the future, TULiPPS’ development partners will offer turnkey systems and production lines for those module manufacturers interested in taking advantage of the many benefits offered by the new module construction method. Although COSMOS module technology is still under development, TULiPPS has received considerable interest from module builders (and currently is working with two module producers) for this new functionally integrated module technology, which is expected to open new markets in the developing as well as developed world. BIPV solar modules are only one of several major PV module technologies TULiPPS Solar currently is developing.